Biscuits are among the most simple and delicious baked goods you can make at home. Start to finish in less than 30 minutes. Give ABK’s Best Butter Biscuits a try today. You’ll never want to eat a store bought biscuit again! What makes a great biscuit? Best Butter Biscuits start with a few simple ingredients. Biscuits, like pie crust are best when keep simple. No fancy equipment is needed when making biscuits, although I do like to use biscuit cutters. Flour, baking powder and salt are always a must. Then it’s time to choose a fat. I have experimented with several types of biscuits over the years. Sour cream, cream, shortening, coconut oil, you name it, I’ve tried it. My favorite, up to a couple of months back, was a biscuit made with buttermilk and shortening. The shortening I use is butter flavored, so it gives the biscuit a nice golden color and the flake factor on the dough is amazing. In the past few years, I’ve grown a little tired of my old go-to recipe and decided experimenting with butter would be a great alternative! Many people will tell you the secret to a great biscuit is shortening, or butter, or cream. I’m here to tell you all of those ingredients turn out excellent biscuits. The secret is not over handling the dough. Do not stir the dough or gluten will form and your biscuits will be tough instead of tender. Remember, fold is the motion you need to have in your bowl while making the dough. The less you handle the dough, the better. I handle Best Butter Biscuits like you would a baby, gently and with care. After experimenting for a few months, and eating way way way too many biscuits, I am happy to say I’ve come up with a recipe for Best Butter Biscuits that’s a keeper. I’m not sure where this recipe originated. It was in a file I’ve had for some time, and no name or reference on the recipe. It’s very close to a Cook’s Illustrated recipe I tried a few times…I tweaked my old printed recipe a bit, and know you’re going to love it. ABK’s Best Butter Biscuits are a beginner recipe that is sure to become a favorite in your family! Place rack in center of oven and turn heat to 450 degrees. Lightly grease a 9x13 or other baking pan or cookie sheet. Place the flour, sugar, baking powder and salt in a medium size bowl. Place the slices of butter into the bowl. Using clean hands, or a pastry cutter, cut the butter into the dry mixture until the pieces of butter are small and about the size of peas or similar to grated cheese pieces. Add 3/4 cup cold buttermilk to the mixture. Fold the buttermilk and flour-butter mixture together. Do not stir, just fold until the flour is absorbed. If the mixture is too dry, add a couple tablespoons of additional buttermilk. Dump the mixture out onto a clean, floured surface. The mixture will probably still be a bit dry and crumbly. Take the dough and pat as best as you can into a small square or circle, about 1 inch thick. Fold the mixture over onto itself once. Repeat and fold together again. Each time you fold the dough onto itself, it will start to come together and become less crumbly. Fold mixture again, for a total of three times folding together. Pat gently into a circle or rectangle about 6 inches wide. Use a 2-3 inch biscuit cutter and cut into circular or square shapes. 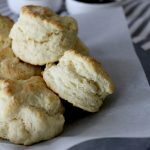 You should be able to cut about 9-10 biscuits from one recipe. Place biscuits onto baking sheet. Bake for 15 minutes or until golden. -If you would like to help prevent biscuits from falling over and losing shape, refrigerate for about 30 minutes before baking. If you are like me, and don't care, bake immediately for about 15 minutes or until golden on top.-To reheat the biscuits, Slice in half and butter lightly. Place in oven and broil just until biscuits are lightly golden inside. Serve immediately. How yummy your butter biscuits are, but the way to make them seems so long. Can you give some illustration videos to help everyone easy to follow your instructions? Hi!!! I love EVERYTHING you do!!! If you refrigerate these biscuits before baking do you just put them in fridge on their baking sheet and then put them in the oven on that cold baking sheet. If so do you adjust the temperature or baking time? I don’t ever refrigerate these biscuits, because I’m always in a hurry. If you do refrigerate them, you can pull them out of the fridge and put them directly in the oven. Just made these for breakfast and they were PHENOMENAL!! And surprisingly easier than I was expecting. Everything I make on your site is so tasty, I trust all your suggestions 150%. Thanks for sharing!! When in a pinch and no buttermilk on hand I use milk with a splash of vinegar. They were beautiful…until they burned. 😩 I should have check them around 12 minutes, I think, because at 15 the bottoms were black and they were VERY crispy. We live in Utah, too, so I doubt it was an elevation thing. But I’ll make them again because the insides were delish! Perhaps your oven cooks a little on the hot side. I’m glad they tasted great and good for you for giving them another try! This recipe is worth a second bake. This might be a weird question .. made these last night and they were delicious!! I know you said the key is to not over work the dough.. so do you reform the scraps after cutting the biscuits to cut more? Or does it not really work too well? I didn’t get many biscuits and felt like I was overworking the dough. Jessica, Not a weird question at all! I usually take the scraps and carefully pat them together and cut a couple more biscuits. Then I cook all the remaining scraps and eat them myself! I love these biscuits. When you put sugar in the dough could you make hand pies or a pie with this dough? Hi Patricia, if you’re looking to make something more like hand pies or a pie, I would recommend using the recipe at this link: https://abountifulkitchen.com/basic-pie-crust/. Thanks for reading ABK! Best ever!!! And I love when I need a yummy “roll” and don’t have a lot of to make some. 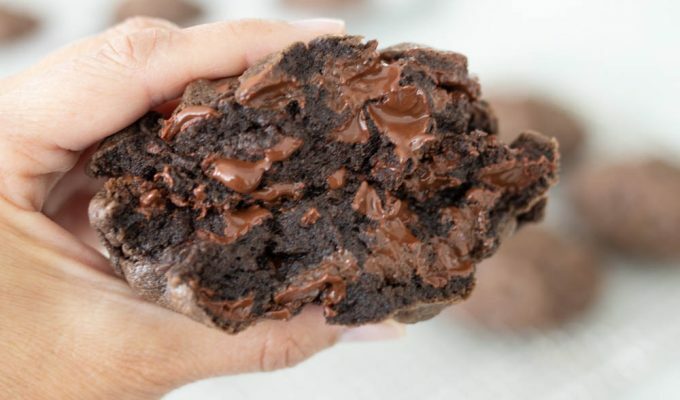 I love how easy it is to make this recipe too, Brittanie, and that the ingredients are pantry friendly. Thanks for sharing and for reading ABK!